The Premier League is back, and that means BBC pundit Garth Crooks returns too with his usually contentious Premier League team of the week choices. Aside from the questionable decision to throw Kyle Walker in as a centre-half and some obvious snubs, it’s difficult to disagree with many of his calls, albeit opinion will obviously dictate that with supporters likely to be disappointed some of their star men didn’t get any acknowledgement. Nevertheless, David De Gea starts us off between the posts after putting a difficult World Cup behind him to produce a solid performance for Man Utd in their win over Leicester City on Friday night. Luke Shaw joins him in the XI, and deservedly so. 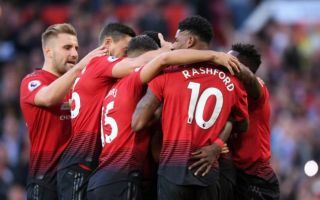 After a frustrating spell at Old Trafford thus far, the left-back put in a positive display against the Foxes to suggest that he could establish himself as the first choice in that position this season. Aside from his tireless running and defensive work, he popped up with what turned out to be the winning goal, with captain Paul Pogba also named in Crooks’ line-up as the Frenchman produced a classy display in midfield having been given the captain’s armband. If United are to compete with the likes of Man City and Liverpool this season, they’ll need Pogba in this kind of mood throughout the campaign to help them dominate games and find that bit of individual class to break teams down. Meanwhile, Aaron Wan-Bissaka, Walker and Virgil van Dijk complete the backline, with all three instrumental in wins for their respective sides this past week. Wan-Bissaka also picked up an assist, while Walker’s driving runs forward on the right were a constant menace for Arsenal as City also kept a clean sheet. Moving into midfield, Pogba is joined by a tenacious Roberto Pereyra who scored twice in Watford’s win over Brighton, and Wolves star Ruben Neves. After playing a fundamental role in their promotion to the Premier League last season, the Portuguese midfielder looks a special talent. Aside from his overall influence in the game, a stunning free-kick coupled with a pin-point assist for the second goal means he deserves his place in the team of the week. Richarlison gets the nod up front after scoring twice on his competitive Everton debut, while Wilfried Zaha also features having bagged a goal in Crystal Palace’s win over Fulham. Meanwhile, it was back to business for Mohamed Salah as he scored in Liverpool’s destruction of West Ham United at Anfield, and overall, Crooks has made a decent start to the new season as all 11 players have a case to be included. However, there are some glaring omissions. Liverpool stars Naby Keita and James Milner arguably should of made it along with Benjamin Mendy as all three impressed this weekend. Milner picked up Sky Sports’ Man of the Match award for his performance at Anfield, while Mendy grabbed two assists at the Emirates. Further Sadio Mane bagged two goals against the Hammers, and yet misses out while Salah gets the green light. Keita, Jorginho and Milner were all better than Pogba. Hennessey was better than De Gea. Mane played better than Salah.. I could go on..
How Keita Mané or Milner didn’t make this side baffles me… ?